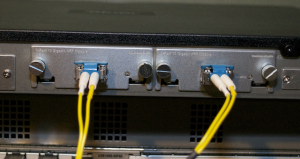 IWNetworks, the US distributor of Edge-Core switches provided Router Analysis with a ECS4610-50T Gigabit Aggregation switch to test in our Gigabit Aggregation Switch Shootout. While we were unpacking and setting the switch up for testing we decided to do a quick review. The Edge-Core ECS4610 series is a stackable Gigabit Ethernet routing switch with a choice of 24 or 48 Gigabit 10/100/1000BASE-T ports, four combo Gigabit Ethernet SFP slots, two optional 10 Gigabit Ethernet slots and two stacking ports on the rear panel. The ECS4600 series is ideal for service provider edge aggregation, Enterprise wiring closets, data center aggregation and network core deployment. It provides high performance, resilient stacking, wire speed L2 switching and L3 routing, comprehensive QoS and advanced security. Comparing directly from their spec sheets, the ECS4610-50T and Dell Force10 S50N both offer line-rate forwarding of packets along with QoS, L3 routing and a host of other features matching with those from Cisco. When you compare prices with the Cisco 3750-E and Force10 S50N the ECS4610-50T offers exceptional value for the money. The product arrived sturdily packed in its original shipping box. 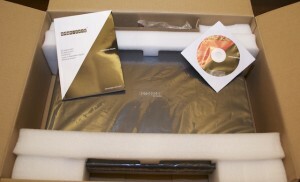 The packaging appears to have been designed to protect the switch while minimizing the amount of packaging and waste. 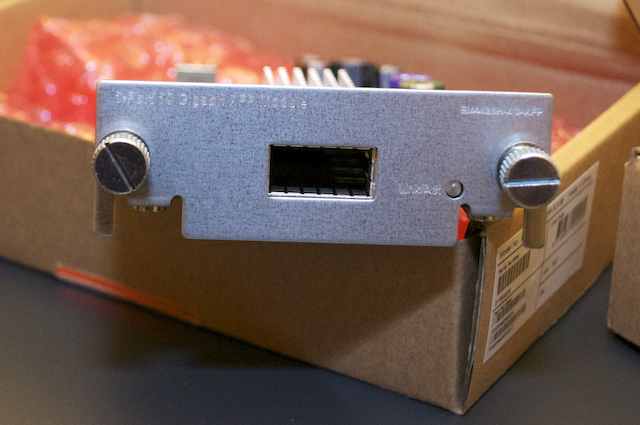 The ECS4610-50T Switch, a power cable, a console cable, a documentation cd and a quick setup guide. The 10GbE modules were in a separate box. 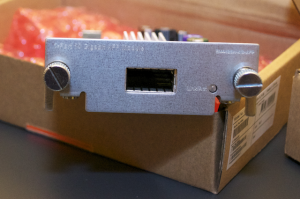 Comparing the ECS4610-50T to a Cisco 3750-E shows that the 3750-E is quite a bit deeper. Installing the 10GbE modules was simple, requiring 4 screws and 2 metal covers to be removed before the modules were easily slid in and secured. On power-on the switch went through it’s POST using a small LCD to display a number letting me know the stage it was in. We were able to console into the switch without issue by setting our console speed to 115,200. Once in, we found that the CLI is standard, like Brocade and Cisco. Configuration is simple and straightforward. If you get lost a ? will help you along the way. The Edge-Core ECS4610-50T is a capable switch that fits well in the service provider and enterprise networks. With more than enough forwarding bandwidth and processing power it fits right in with the other 1GbE aggregation switches on the market. The feature set is comparable to Cisco, Dell Force 10 and other leaders in the space. 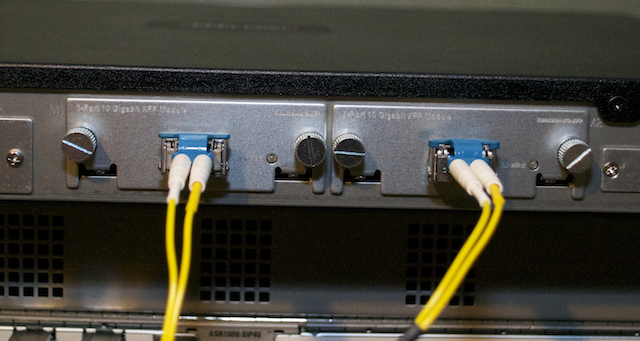 Look for our upcoming Gigabit Aggregation Switch Testing Report which will be released in September for in-depth testing of this and many other switches. For more information on this and other Edge-Core products contact IwNetworks at www.iwnetworks.com.